Born in Japan in 1914, Mokudo Taisen Deshimaru grows up close to his mother and grandfather, a former samurai. 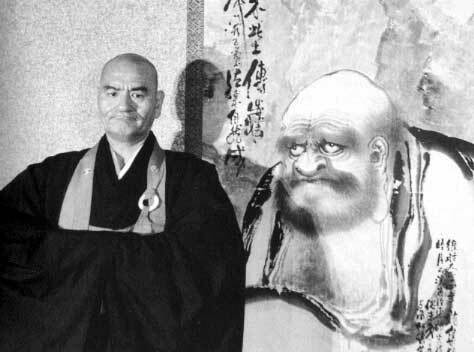 In his youth, he meets Kodo Sawaki, a great master of Soto Zen, and follows his teachings. He was ordained monk by the latter, who asks him to travel to Europe and spread the practice of Zen. He comes to Paris in 1967. Since then and until his death from cancer in 1984, he teaches Zen to numerous disciples, the oldest of which is Kosen Thibaut. In 1975 he receives the official shiho from Yamada Zenji , the abbot of Eihei-ji temple. He founds many dojos in Europe and around the world including France where the main ones are in Paris and Lyon. He also founds the Temple of Gendronnière and AZI (the International Zen Association). He is the author of numerous books about Zen.